My favourite item from the collection is this adorable A4 project book. I love the polka dots & the "HELLO" speech bubble is just inviting you to take a look inside. At £2.95 this was the most expensive item i could see in the collection & thought it was really well priced. When you open the front cover you have a thick plastic divider page covered with black polka dots & a cute cat page marker peeping out. The book is divided into 4 sections & as you can see there are 4 different markers so you can section off your work. When you turn the divider page over you are met by lined pages, edged with polka dots & that cute cat there to keep you company on each & every page. So cute! Your next divider is pink & white striped with a little girl holding a camera & Big Ben page marker. I particularly loved this image as my 7 year old daughter is called Amelia & sometimes wears her hair just like the little lady in this picture. The pages for this section are coloured lines with the striped pink edging, so a bit more fun & Amelia(as we shall now call this character) appears on every page. Divider 3 is grey with a pink edge & the page marker is a camera. This is the section i will be using for my Blog ideas. How perfect! As with the other sections, the themed divider picture appears on every page to remind you which section you are in. The final divider is dark purple with a speech bubble page marker. As per the rest of the book the divider theme is apparent on every page. The next item i spotted was this totally pinterest worthy pencil case. At only £2 i popped it in my basket without a second thought. The PENS & STUFF font reminds me of the font i use on my daily food diary over on Instagram. Look at the other side of the pencil case. 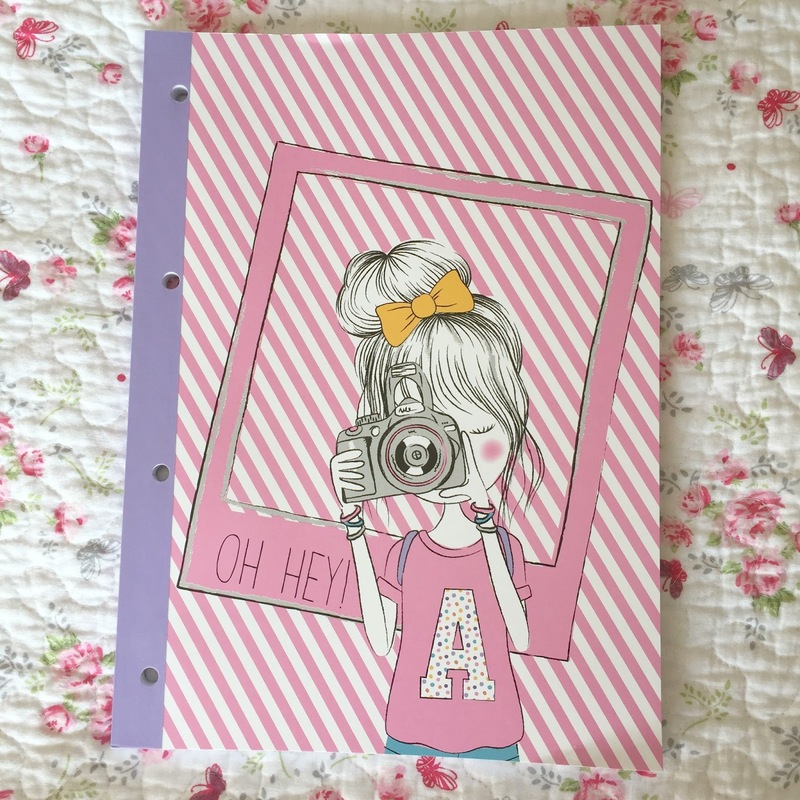 How can this not be perfect for a blogger! This little guy was looking at me so how could i not pick him up. Well i did need a pen to go in my new pencil case didn't i. This cat pen was only 75p & comes in a plastic zip wallet so you could store some other bits in there with him. Finally, i picked this A4 lined pad up for Amelia herself as it was just £1. She will be able to keep up with her handwriting practice throughout the Summer holidays in this super cute book. 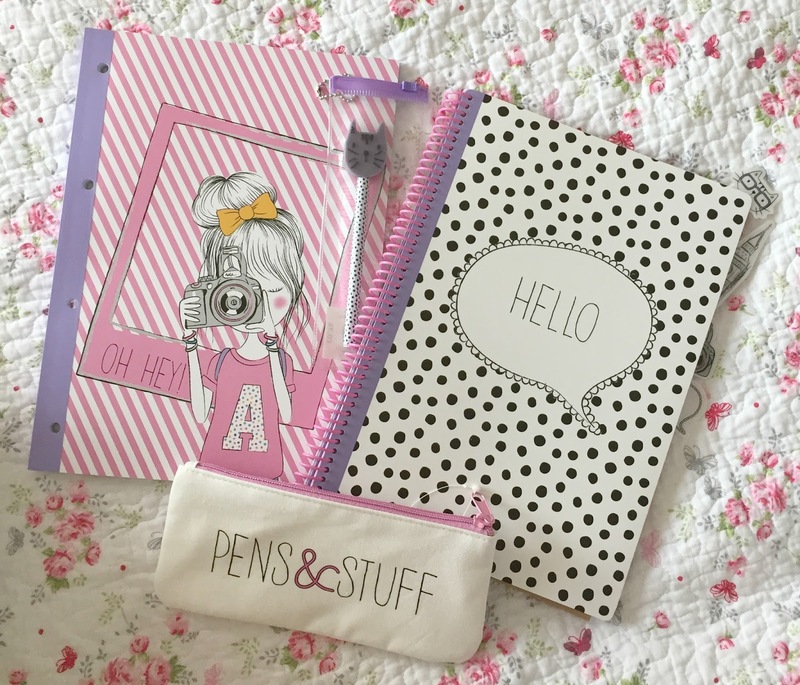 As well as the items i've shown in this blog post, there are lots of other bits in this range too including an A4 ring binder to put the pad shown above in. It is all really inexpensive so even though i am 42 years old & a complete stationery nerd, its suitable for all ages. Wilkos have another couple of ranges too if these are maybe too cutesy for you. They change their stationery ranges each season so if you love this range then go & grab it now as i'm sure it will sell out fast. I would love to hear your comments on which is your favourite items & if you think you'll be picking them up the next time you are in Wilkos. I saw this range in store and completely fell in love with it! The pretty pastel colours, the polka dots, the stripes... oh my!